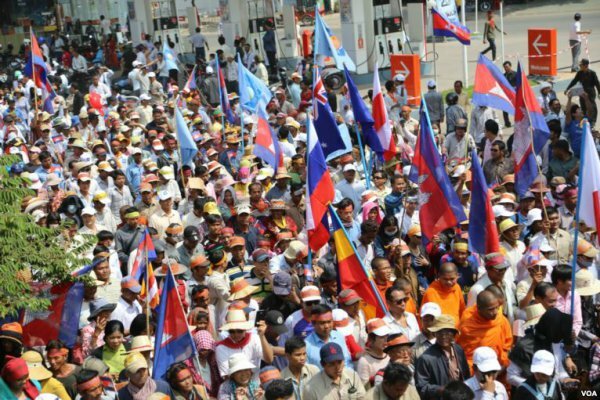 In January, Cambodia celebrated the 40th Anniversary of the Vietnamese invasion that ended the Khmer Rouge regime in the country. Every year, these events offer a particular conundrum for the people: On one hand, Vietnam’s role in ending the Khmer Rouge cannot be understated. On the other hand, the current Cambodian PM’s love affair with a country that is not excelling in its human rights record remains only worthy of condemnation. Early this month as Cambodia marked the 40th anniversary of the Vietnamese invasion that overthrew the Khmer Rouge regime, members of the diaspora in Melbourne and Sydney launched coordinated protests condemning the imposition of the so-called “Victory Day” commemorating January 7, 1979.
arly this month as Cambodia marked the 40th anniversary of the Vietnamese invasion that overthrew the Khmer Rouge regime, members of the diaspora in Melbourne and Sydney launched coordinated protests condemning the imposition of the so-called “Victory Day” commemorating January 7, 1979. Cambodians have been acutely aware of the policy of expansionism engineered by the Vietnamese government. As much as Hun Sen learned to evolve from communism to dictatorship, so has Vietnamization in Cambodia. Once upon a time, it was actual violation of national sovereignty through territorial occupation. Under Hun Sen’s newly found international cooperation, with political opposition banned, Vietnamization takes the form of economic, political and military “cooperation” – free of accountability, transparency and criticism. In normal daily dialogue, every Cambodian avoids any reference to that date, January 7. It is an extremely sensitive and contested issue, both culturally and politically divisive. The issue of Vietnamization remains fresh and raw. Cambodians still feel the loss of former territories in the lower Mekong Delta, known as Kampuchea Krom to Vietnam. Another factor is the fact that the Vietnamese diaspora in Cambodia has been accorded full privileges and first-class treatment by Hun Sen’s regime. Most heads of ministries, tycoons and generals are either descendants or remnants of the occupying Vietnamese forces who did not leave Cambodia in 1989. Likewise, the Vietnamese language and associations are allowed to prosper under Hun Sen’s rule. The opposite could not be said for the Khmer Krom, who have been subjected to human-rights violations by the Vietnamese authorities. Another source of resentment is that neither the Hun Sen regime nor Cambodia’s king has ever made representations to Vietnam regarding ill-treatment of the Khmer Krom. What was successfully prevented by successive Cambodian kings and leaders since the French protectorate was established in 1863, and the objectives of the 1991 Paris Peace Accords, have now been totally trashed by Hun Sen as he has successfully and victoriously integrated Vietnam’s internationally condemned invasion into Cambodia’s cultural, national, social and political identity. In fact, Hun Sen reportedly used the same style of “win-win” policy last year, shortly before he used Cambodia’s Supreme Court to dissolve the main opposition party, telling opposition commune councillors that they could hold on to their jobs if they defected to the ruling party. “This is a win-win policy,” he said. But the problem is that Hun Sen is still is a Khmer Rouge cadre, except he is now a ruthless and merciless dictator who is obsessed with violence. Fearing that Hun Sen’s legacy is internationalized, notably with the regime’s nefarious activities on Australian soil, members of the Cambodian-Australian community protested the presence of Cambodia’s ambassador, Koy Kuong. While Hun Sen is free to create his legacy in Cambodia, the diaspora demands that it should remain there. For the West, including Australia, is not an outlet to produce dictators-in-waiting like Hun Sen’s son Hun Manet nor is it a place for inciting hatred based on a superficial legacy.